Plan a direct-mail piece to set the tone for the year. 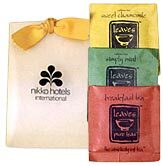 Inexpensive, lightweight items include perfumed sachets or scratch-and-sniff stickers. Your message: “We’ve got fresh ideas for your business this year.” Add a phone number or web site and you’ll be in sight and in mind by engaging multiple senses. Show associates you care with scented gifts to refresh the soul. Give them a “Freshen Your Workday” kit. Include a scented candle, lavender-infused antibacterial gel, scented pen and herbal tea packets. The recipient will appreciate the gesture and become more productive as a result. Make the most of promotional products with antibacterial properties. There are pens with antibacterial coatings, thin sleeves of scented paper-soap to keep in wallets or purses and antibacterial towelettes in logoed packets. A unique gift is aloe-plant stalks that can be planted by the recipient. Distributed in plastic imprinted wrap, this gift is truly refreshing and healing – not to mention perfect for a message of growth. Whichever approach you choose, a creative twist on the concept of providing your target audience with fresh ideas is certain to generate curiosity among recipients. To talk about this idea, give us a call at 708-478-8222 or send us an e-mail!